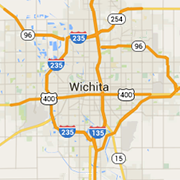 Relax and enjoy one of the Wichita area parks and recreation facilities. Enjoy four lakes, miles of path ways, fishing, biking, jogging, playgournds and shelters for your family activities. Veterans Memorial Park is dedicated to the men and woman who have fought for freedom. The best Wichita skateboard park with over 12,000 square feet of conrete, bowls and a huge street course.